This is a well loved medieval silver-gilt betrothal/wedding ring, dating to the 15th century. It is decorated with a pair of clasped hands with a crown above. this would have presumably represented a crowned heart. The detail is however very worn (with at least a lifetimes of use) as such a testament to long and happy marriage! 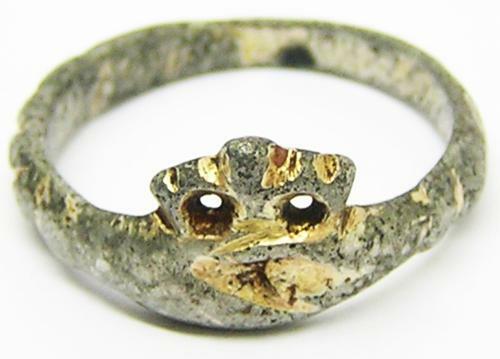 A nice example of a wearable medieval ring from the turbulent period of the Wars of the Roses. DATE: c. 1420 - 1520 A.D.
PROVENANCE: Ex. Private Collection, London, originally found in Nottinghamshire.